What is a Coffee Press? For 70% of coffee lovers, every day starts with making a cup of coffee at home, and chances are that you want to brew it like a barista. Thus, you start looking for the brewing method that makes the best cup. Nowadays coffee lovers have a great variety of coffee preparation methods: a drip, a Moka pot, a coffee machine, a coffee bag, an Aeropress are just a few of coffee brewing methods available. If you trust thousands of coffee lovers around the globe, you need to give a French press a try. It’s a simple brewing method that makes an earthy, rich taste in the cup. Moreover, it doesn’t take much time or effort if you know how to use a French press. Want to enjoy French press coffee? If the idea of using a coffee press attracts you, keep on reading this article to understand everything from A to Z about this device and brewing method. A coffee press, also known as a French press or plunger pot, is a coffee brewing device. It looks like a teapot or a creamer – a pot with a plunger and filter screen that makes coffee when you pour hot water through the ground coffee and press it. The history of a coffee press dates back to 1929 when it was created by Paolini Ugo and then patented by an Italian man, Attilio Callimani. However, its design had several changes before it became popular among coffee lovers in Britain, Europe, and the USA. Today, the anatomy of a French is quite simple: the device has a container made of glass, ceramic, or stainless steel, a frame, a handle, a built-in filter screen, and a plunger knob. Plus, it has several details (a lid, a spiral plate, and a cross plate) that keeps the grounds of coffee so that you get a perfect cup of coffee. As you can see, a coffee press has many details, but it looks compact anyway. Moreover, it’s not the only one benefit this device has. cost-effective: the price for this device starts at $20, so every customer can find a French press that meets his or her budget. Plus, it doesn’t require filters, so you won’t spend money on additional elements. All in all, you can brew a perfect cup of coffee without wasting much. easy-to-use: while coffee machines are programmable and you have to look through the manual before starting using them, a coffee press has no complexity. Actually, it’s perfect for any age or coffee brewing skills. portable and compact: if you don’t have much space in your kitchen or if you travel a lot and you can’t live without a cup of coffee, a French press is right for you. This device is small, so it’s easy to find a place for it, no matter where you are. As you can see, the device has many benefits. However, it also has some drawbacks that you should take into consideration before start using it. time-consuming: when you choose a coffee machine to brew your favorite beverage, you can program the device to brew coffee for you. When you prepare coffee with a French press, it takes much time – not only the process is longer but also it requires your assistance. To make a good cup of coffee with a French press, you have to take control of the process to avoid over-extraction. difficult to clean: although many people claim that a French press is low maintenance, I can’t agree with this idea. For me, it’s hard to clean all elements of a coffee press as it has too many details and filters. Thus, old grounds always stuck. 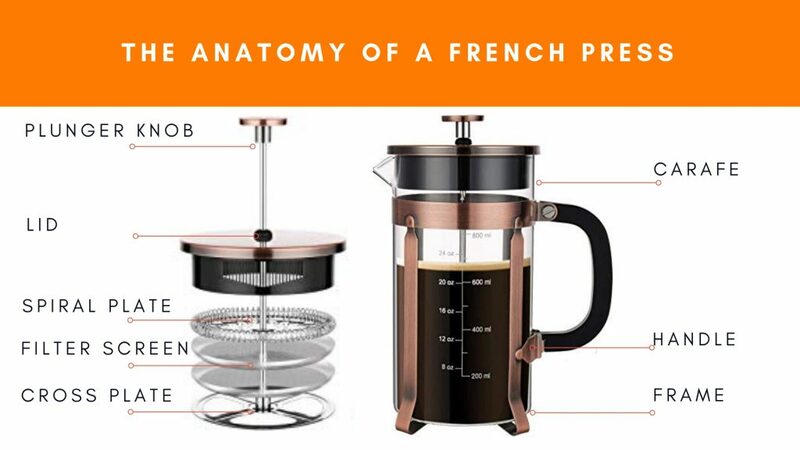 Once you know what is a French press, you may want to understand how it works. 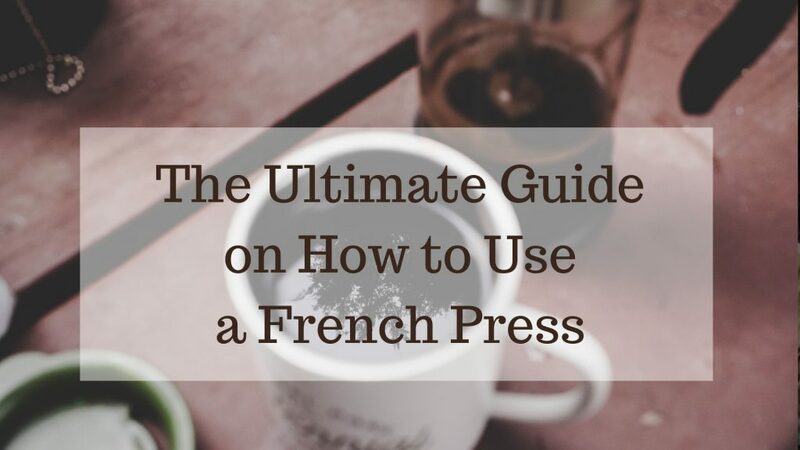 And if you plan to use it at home, it’s no wonder you’re looking for information on how to use a French press. First things first: a coffee press works slower than a drip coffee maker. However, you can expect a perfect cup of coffee if you know how this device works and how to make the most out of this process. When you place coffee grounds at the bottom of a carafe and steep them with almost boiling water, the brewing process begins. During the steeping, ground coffee gets water, and therefore coffee starts releasing flavor. Since this device has an in-built filter, it keeps the robust natural flavor of the coffee grounds. Just within 4 minutes, you can push on the press slowly to finish the process and serve coffee right into cups. To start brewing, it’s important to prepare your French press by rinsing it with warm water. Once you have bought a device, it’s high time to understand how to use a French press. To save your time, we’ve prepared all the information you need to brew a perfect cup of coffee. We recommend you to save the following image and keep on reading the article to figure out every step of the brewing process. measure coffee and fill: it’s important to take the right amount of coffee: for a standard size coffee press (32 oz), take 3-4 servings or 51g of coffee beans to grind them. pour water: since the perfect temperature for brewing coffee with a French press is 190-205F which is below boiling, always boil it before grinding coffee. Once you’re ready, fill a coffee press halfway with water. Within a minute, pour more water. steep and brew: once you’ve mixed water and coffee, place the lid on the press and let the coffee brew for 3-4 minutes. If you notice “foam” at the top of the coffee, it means it’s ready for drinking. press and enjoy: when your coffee is ready, push on the press until it reaches the bottom of the device. Then, serve it: pour coffee into your cup and taste your beverage. With practice, you will be able to brew coffee without tracking time. Plus, you will find out the perfect brewing time for your taste. Let’s face it: every customer has a specific budget he or she is ready to spend on buying coffee equipment. However, not only the budget plays role in choosing a coffee press, but personal preferences also should be taken into consideration. Thus, most coffee lovers pay attention to the brand and design. But there are a few specific recommendations all customers should consider. Capacity: depending on the number of coffee lovers in your family, you may need either a small (3-4 cups) or large (8-12 cups) French press. It’s also important to remember that coffee won’t get stale when you choose a small coffee press and it can sit and over-steep if you select a large one. 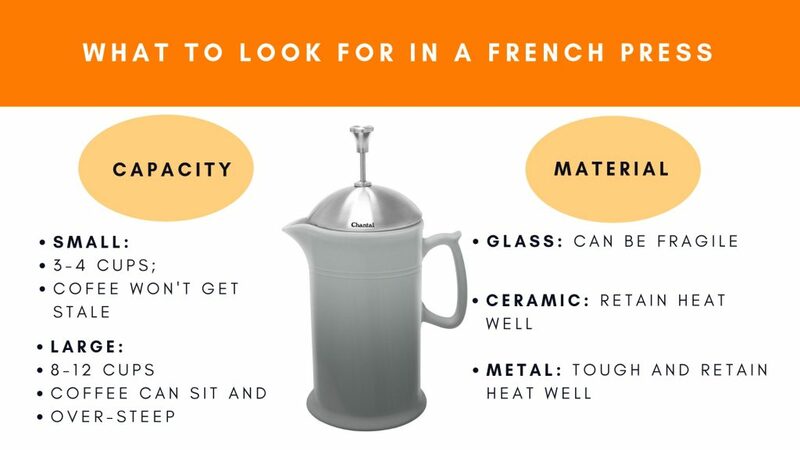 Material: French presses are made of different materials – glass, metal, ceramic, and each of them has both pros and cons. For example, a glass coffee press is cheap, but it can be fragile. If you’re looking for a good device that can serve you many years and you love drinking hot coffee, a metal coffee press is the best choice. As for me, I have a small ceramic French press: 17-ounce capacity is enough for me to enjoy a hot espresso as this device keep heat well. 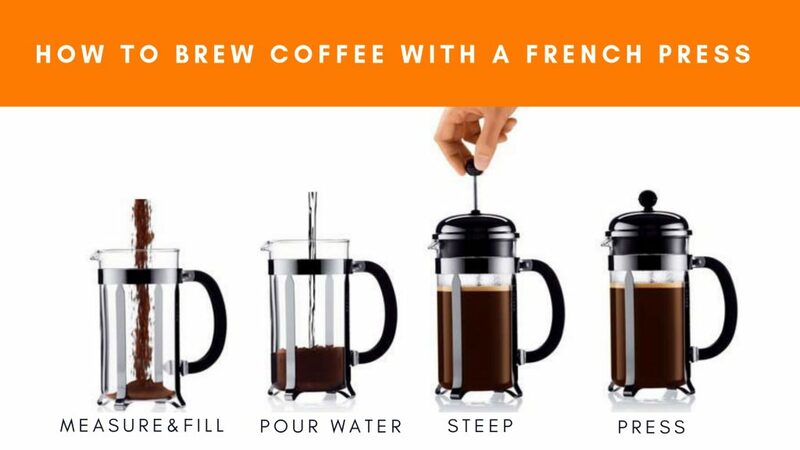 A French press helps coffee lovers all over the world, and it’s no wonder this brewing method is one of the most favorite among European and Australian people. This device is cheap, compact, and easy-to-use, so it has many benefits to be considered as a brewing method. As you can see, it doesn’t require much skills or knowledge to understand how to use a French press, so you find a device that meets your needs and brew your cup of great coffee today! Have you ever used a coffee press? What are your thoughts about this device? Don’t be greedy to share your thoughts!